Lewis Carroll’s much beloved, supremely nonsensical Alice in Wonderland–composed of two volumes, Alice’s Adventures in Wonderland and Through the Looking-Glass and What Alice Found There–opens itself up to many types of interpretation. 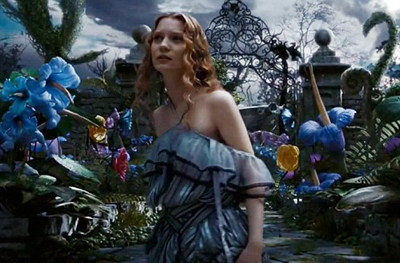 On film, Wonderland can be dark, it can be trippy, it can be chaotic, it can be threatening. All of these aspects are woven into the original novels, albeit often in a less direct manner than most film adaptations have presented them. What Alice should never be, however, is dull, dreary, or regimented–three adjectives that, unfortunately, describe Tim Burton’s Alice all too accurately. Burton, famed for his dazzling visuals and often madcap style would seem to have been the perfect director to bring Alice to the big screen. Instead, he has done the practically unimaginable. He has made the incredible, dull and the endlessly imaginative, curiously flat. By taking the freewheeling and episodic construction of Carroll’s novels and restructuring it, forcing its characters into a conventional fantasy plot–and not a particularly interesting one, at that–he and screenwriter, Linda Woolverton, have stripped Alice of what made it so unique and vivacious in the first place and what has caused it to endure all of these years, and left in its place a soulless reproduction that shuffles bits and pieces of the novels, name-checking surface elements, but never failing to utterly miss the point. Instead of a young girl wandering through an alien, fantasy landscape and being introduced to all manner of bizarre characters, each of whom exists on his or her or its own completely unique wavelength, this Alice is about a young woman of 20, who, immediately after being proposed to by a boring git, dashes off after the infamous White Rabbit to her fate in Wonderland–or Underland, as it is pretentiously and portentously referred to here–only to discover a ravaged country, unkempt, overgrown, and oppressed by an evil dictator, the Red Queen. Upon her arrival, a band of united revolutionaries pressures her to be their champion and to take up arms against the Queen and her pet Jabberwocky. There is a prophecy written in the scroll of an ancient Oracle, in fact, that foresees the day when Alice will slay the Jabberwock–its name, “The Frabjous Day.” Just the use of that word is evidence of how overly literal this film is. In Carroll’s poem, the father elatedly cries out, “Oh frabjous day!” when his son slays the beast. In Burton’s film, the day has been assigned this mythical title countless years ago. Another example of the film’s overly literal nature is the moat surrounding the Red Queen’s Palace, which is full of the severed heads of people she has had executed. In the book, the Queen’s famous line, “Off with his/her head!” is a threat that is never carried out. Since she doles out this sentence so frequently, she would have no subjects left if it were. One gets the sense that the Queen is so mad, she may not even realize she has ordered an execution moments after she has done so, and that she may sentence the same person multiple times in any given day. In the words of the Gryphon in the novel, “It’s all her fancy, that; they never executes nobody, you know.” In another scene, the King (who does not appear in the film) sets everyone free whom the Queen had incarcerated. Burton either disregards or willfully ignores this. What is most troubling, however, is that Burton doesn’t seem to care about honoring the tone or spirit of Carroll’s work. Gone are the poem parodies, the brilliant wordplay, the mindbending whimsy of the original. The dialogue here is pedestrian and uninspired throughout, which is anathema to Carroll’s masterpiece. What was mysterious in the novel becomes mundane here–the fabled “frumious Bandersnatch” is depicted as a large, funny-looking, dog-like creature with spots. Gone are the original identities of most of the characters–for example, rather than being a narcoleptic, Burton’s Dormouse is an adventurous rodent full of derring-do and blustery self-importance to match (and rip off) C.S. Lewis’ Reepicheep from Narnia; the Knave of Hearts isn’t a petty thief but the Queen’s most menacing assassin and possibly her lover, as well; the Cheshire Cat isn’t mad and mercurial but is just a scaredy-cat who disappears into a fog whenever he feels threatened; the White Queen isn’t a doddering old lady in a shawl who says things like “Jam tomorrow, and jam yesterday, but never jam today” but is instead a slim, young woman who walks through rooms with her arms held aloft, like an airheaded parody of a Disney princess, and has taken a vow against performing acts of violence, but feels no compunctions against compelling others to do them for her. Rather than adapt his style to suit the piece, Burton inorganically grafts his morbid, grotesque sense of humor to Alice, even though his particular brand of humor isn’t quite appropriate for the piece. Why does the “good” White Queen have a bowl full of desiccated corpse hands to mix into potions? 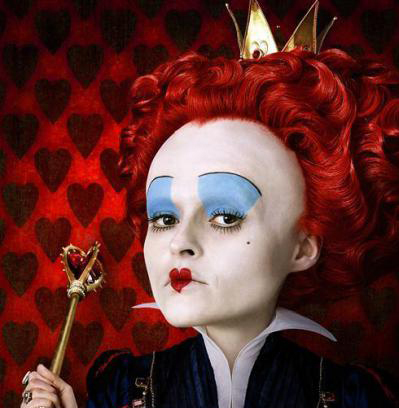 Why is the Knave of Hearts terribly scarred and missing an eye?Burton’s weird is not the same sort of weird as Lewis Carroll’s weird, and that is the problem. This is what similarly tripped up his version of Sweeney Todd: he turned it from a morally complex, tragic character study into a freaky slasher flick. Lately, Burton often seems more enamored with dressing Johnny Depp and Helena Bonham Carter up in ridiculous outfits and letting them cut loose than in telling a story. The Mad Hatter may be an iconic Alice character, but he is no more central than any other character in the book, and the only reason he is so prominent here seems to be that Burton wanted Depp on screen more often. He isn’t doing what’s best for the story but is, rather, indulging himself and his favorite actor. I’m not even going to go into why he might feel that the Mad Hatter would be best depicted as a clown zombie with shock contact lenses, nor why he does nothing to reign in Depp’s outrageous mugging and his continually shifting accent, nor why the Red Queen has an enormous head and speaks with an outrageous lisp. 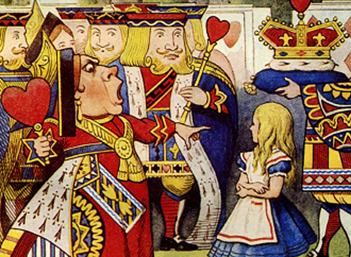 The original Alice in Wonderland is zany insanity, but it is zany insanity with a purpose. Though it may seem completely off-the-wall today, it is actually a very pointed satire of Victorian society, and specifically how a child growing up in Victorian society would relate to the strange adult world, with its seemingly arbitrary rules, that surrounded her or him. One of the major reasons Alice still resonates might be because it so deftly captures that feeling a child often has of being at the mercy of a large, scary world he or she cannot understand but into which she or he must learn to assimilate, in order to eventually be a member of society. In the first Alice book, Alice has almost no control over what happens to her–whether she grows, whether she shrinks, whether idiotic people are being verbally abusive to her–until its final moments, when she finally learns to bend the rules in her own favor. Right on! Tim Burton just needs to stop already. Edward Scissorhands was great, yes, but I don’t see that sort of magic happening again. Johnny Depp just likes to play dress-up and practice his accents these days. And by the way, that sequel? Absolutely terrible. My 11-year-old daughter was really annoyed at the whole time travel thing. She wasn’t even interested enough to finish the thing. And why on earth did they need to make up the pseudo-villain “Time” when they had a perfectly interesting, mysterious Red King they could have worked with? And that scene where they muppet-babied all the characters? Just so wrong. For anyone interested, I’ve written a fantasy novel that’s loosely based on both the Alice stories and a couple of Oz books. It’s called “Adaleide in Ozghard”, currently available to read for free on Wattpad.com. My story isn’t overly dark and violent just for the hell of it. It has heart. I wrote it at a time when my daughter was the same age as the main character, so that should tell you something.